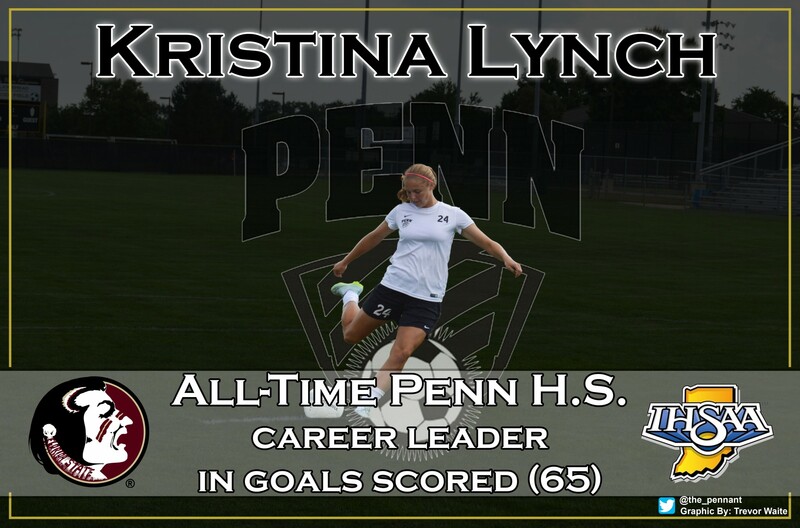 Florida State recruit Kristina Lynch scored two goals to become the Penn Girls Soccer career scoring leader, and helped the No. 1-ranked Kingsmen overpower South Bend Riley, 9-0, on Thursday, Sept. 15. Lynch, a junior, has 65 goals. She topped the previous standard of 64 goals, set by Katie Hojara (2011). Brooke VanDyck recorded her 11th assist of the season, three shy of the school record. Penn, 10-0-1, is No. 12 in the nation in the TopDrawer Soccer rankings, and No. 27 in the USA Today national rankings. Penn plays Leo and Canterbury on Saturday in the Canterbury Invitational.